Watch Kim Jung Gi create a stunning Wonder Woman illustration. Wonder Woman has been one of the most talked about films of 2017. The film – which tells the story of how the Amazonian warrior version of Princess Diana becomes Wonder Woman – has racked up box office records and inspired a legion of fans to emulate the heroine. It's also made an impression on artist Kim Jung Gi. The South Korean illustrator has already achieved global recognition thanks to his characterful and realistic sketches, which can be found in a number of collected volumes. 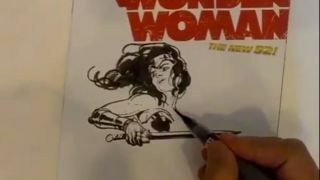 In a recent video Tweet, though, Jung Gi shared a glimpse into his creative process by drawing Wonder Woman on a comic edition with a blank cover. The mesmerising clip sees the artist build up the illustration in ink without the need for pencil guidelines. Jung Gi's grasp of anatomy and form is breathtaking – he draws a near-perfect oval in one take for crying out loud! So prepare to be amazed by watching the video in full below.